Binary Scam Alerts is continuously getting complaints about the Millionaire Blueprint Software, App, and Autotrader (AKA the Free Money System) and Walter Green as well as Walter Carter. It seems some very deceptive marketing tactics were utilized to bring this fraudulent system to a point where it has become extremely effective at cheating people out of their money. Our investigation clearly shows that shady, unregulated binary options brokers are also involved behind the scene, and this is the most dangerous and illegal aspect of this criminal piece of software because the complaints are just mounting as victimized day traders keep complaining how their withdrawals are being declined without valid reasons. 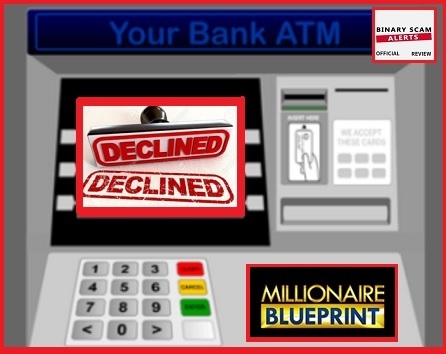 There are various levels of proof which shed light on this evil scheme, however the first and most obvious has to do with the fact that the main sales video has been copied from The Free Money System and re-branded as the Millionaire’s Blueprint. Now, for those of you who are new to binary options and have not read our previous reviews, it’s worthwhile mentioning that the creators of this obvious sham thought it was a good idea to take an existing pile of rubbish and for some unknown reason wrap it around new graphic designs and concepts and then push the same dirty scam with a different twist. I believe they are not fools and did this because this specific video has proven it has an uncanny ability to convince people to register and fund trading accounts in a consistent manner. The second level has to do with the fact that there is no software to be shown. We have discussed this previously, however this is extremely important as the old saying “Where’s the Beef?” is particularly relevant in this context. Another important aspect of this deception has to do with fake testimonials and actors that are used to convey a feeling of legitimacy and sincerity. Well, this can be nothing further from the truth as lies and half/truths are used in a very manipulative fashion with the clear intent of misleading customers and traders. Finally, inflated figures of phony bank accounts are used excessively and we urge you to be on guard and proceed with extreme caution when approached with similar offers. Additionally, photo-shopped bank statements are one of the more obvious red flags and scream fraud. The saddest part about this story is how people are denied their winnings based on scam broker tactics such as forcing bonuses or lies about how the documentation has not arrived or it being invalid. If you encounter any of this kind of rouge and criminal behavior, please make sure to report the broker and the system immediately in our “report a scam section” and make sure you provide all the necessary proof and documentation to validate your claims. It saddens me to see how the rogue brokers cooperate with the marketers in what is an obvious scam and malicious attempt to defraud and victimize day traders. I believe that the brokers and affiliates are two sides of the same coin and by acting as a third party and separate entity they insulate the broker from possible legal implications as well as reduce operational constraints. Hence, the alliance serves both sides and it fits like a lid on a pot of stinking stew. How Many Versions of The Same Phony App? Technically speaking there are two versions, the original one is what we know to be “The Free Money System”, and it has a black frame with a small field at the bottom to enter your email. The second version is what we know to be the Millionaires Blueprint, which is the same sales video but wrapped with a different sales page and graphic elements. Since then many marketers have understood the almost magical ability of this actor to blindly beguile customers and lead them by the nose like the Pied Piper from Hamelin, and we all know how that story ended. These include but are not restricted to the Push Money App, My First Online Payday, Binary Matrix Pro, The Free Money System with Walter Green,Binary App 810, TrianaSoft, the Amissio Formula, Tauribot, Citidel,Centument, Virtual Income, Insured Profits with Dave and Ginny, Sydney System, Centument, TSI System Scam, Trade X Confidential, Limitless Profits, Millionaire’s Blueprint, and Trade Tracker Pro. We always see new stuff coming out and it really does boggle the mind how some of these systems are stuck in a kind of 80’s mode and look like some cheap imitation with a rehearsed “grab this opportunity now” theme. We fully endorse the Binary Profit Method as our preferred signals solution, and Virtnext is one Auto-trader in our recommended section. To conclude, we have concluded that the Millionaire Blueprint Software, App, and Autotrader (AKA the Free Money System) managed by Walter Green the fraudster is a SCAM and not to be trusted. There is not one thing which is genuine, honest, legit, or sincere about this dangerous and misleading system, and we urge all our members and viewers to use extreme caution with this offer. We would also like to extend a personal invitation and kindly ask you to join our Facebook group and Subscribe to our YouTube Channel.